Connect with UNMC through social media. Dr Derek Irwin, Head of School of English, was celebrated with an evening of performances at the Drama Studio last Thursday as he bids UNMC goodbye to further his research at the Ningbo campus. UNMC’s Performing Arts Platform held an open stage farewell performance, themed ‘Departure’, featuring choral numbers, orchestral pieces, poetry recitals, video screenings and an improv play, among others, on its roster. This was a touching tribute to Dr Irwin as one of the pioneers who established UNMC’s performing arts scene, especially in theatre. Michelle and other cast members of MND parodied Dr Irwin’s adaptation in an improv performance titled A Midsummer’s Nightmare. It involved Dr Irwin comically playing the role of Thisbe, which earned roars of laughter and enraptured applause from the audience. He then delivered a hilarious stand-up comedy monologue on his childhood memories of Canada and its distinct culture. Other highlights of the evening included a choral performance of ‘Let the River Run’, a Chinese orchestral performance of classical Chinese compositions and a spoken word presentation by Sheena Baharudin. 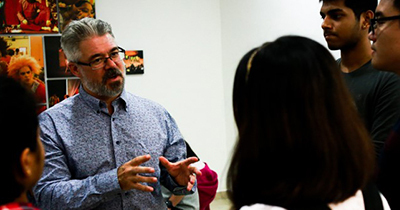 In addition to his theatre work, Dr Irwin established the School of English (SoE) in UNMC over three years ago, consequently making English with Creative Writing degrees at Bachelor’s and Master’s level available in Malaysia. Assistant Professor in the SoE, Dr Shivani Sivagurunathan, shared her experience working with him. “I think he’s not only talented but incredibly kind, compassionate and very available to his colleagues and to the students, so there’s just a lot of admiration from me to him. Going to Ningbo, Dr Irwin hopes to develop the artistic movement there, continue studying Chinese and have time to complete and publish the research that he had worked on in Malaysia. While Dr Irwin will now be based in Ningbo, he will maintain links with UNMC as he is supervising the PhD students and returns next semester to conduct modules. IGNITE wishes Dr Irwin all the best on his paper and happy teaching in Ningbo! Photography by Malik Hisyam and Shalyn Izura, write-up by Suanne Tan and Jonathan Sim.